Family-owned forests are vital to the economy and quality of life in the Inland Northwest. These lands are critical for wildlife habitat, timber supply, water quality, and many other values. 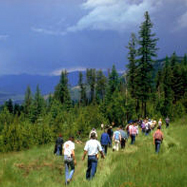 Unique skills are required of foresters and other natural resource professionals who help family forest owners manage their property. The Family Foresters Workshop is designed to strengthen the skills of consulting foresters, state-employed service foresters, and other natural resource professionals who work with family forest owners. It serves as a forum to provide updates on emerging technology and knowledge applicable to family forestry. This year’s program will be held at the Coeur d’Alene Inn (located off Interstate 90 at Hwy 95 exit) on Friday, January 20, 2017, and features presentations on: examining seed sources – the seedlot selection tool; the Idaho survey of family forest owners; managing forests that include beavers; biochar and inexpensive kilns to make it; reducing fire risk across mixed ownerships; the Oregon Woodland Cooperative; the effectiveness of riparian buffers on stream temperature; and the annual family forest economics/policy update. The program can accommodate up to 100 people. Registration forms are available at local University of Idaho and Washington State University Extension Offices, and should be returned by January 12, 2018. An $85 registration fee ($90 for online registration with a credit card at www.uidaho.edu/FamilyForesterWorkshop) covers handouts and refreshments. For questions on the program, contact: Chris Schnepf at (208) 446-1680 or Andy Perleberg at (509) 667-6540. This entry was posted in Event Announcements on November 8, 2017 by AgClimate Admin.